Here’s a mighty list of 100 best iPhone, iPad apps that are compatible with Google Chromecast dongle. The complete list of titles can be found after the jump. Remember, there’s an app for almost everyone here. From apps to games, the list includes a lot of titles that make good use of Google’s amazing and ultra-cheap cross-platform Chromecast dongle. It’s amazing what the Chromecast dongle is capable of doing given its mighty low price tag – $35 from the Play Store, and even lower if you grab it from a place like Best Buy or eBay. The assortment of apps listed above includes a wide variety of titles, from great casual games to apps that turns your TV into a video, photo or audio streamer – from entertainment to sports – there’s something for everyone. If you have a Chromecast with an iOS device at hand and don’t know where to start, then the above list has you covered from start to finish. Do let us know in the comments section below what you think about the apps we’ve chosen. And if we’ve missed something which is worth mentioning, then do tip us on it. I want to be able to mirror my iOS devices. And how many of those work outside the U.S.? I’m not (just) being snarky. I’m asking. Get a Surface! Works great with the Chrome app to mirror. 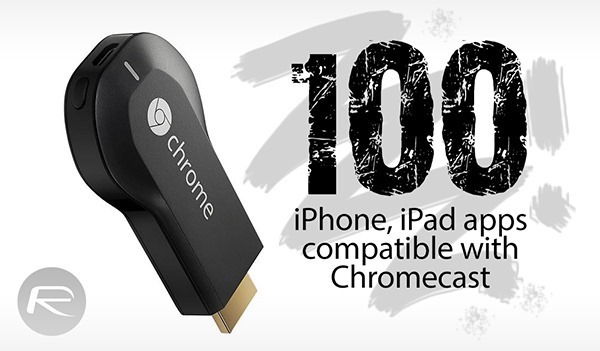 December 2014 and still no support of chromecast in the chrome browser for iOS. Get an Android. Experience Freedom. William Wallace would have an Android because he wouldn’t be shackled to iOS.FREEDOM!!!!!! I think William Wallace would have had an iPhone. A jailbroken iPhone. On secon thought, he would be a developer that writes jailbreak code and had a repository of his own ! Chromecast doesn’t work with any apps that you need to geoblock to access. That’s because the DNS setting is hard coded into the firmware. It doesn’t matter if the DNS on your iOS app is changed. Get Amazon Fire TV or a Fire stick: one can change the DNS on it. Get an APPLE TV if you want to mirror. It’s much more iphone friendly of coarse and enables you to do much more! Every all on ITUNES WORKS ON APPLE TV.